This blog was written by William S. Rutchow at Ogletree Deakins, author of our Model Policies and Forms for Tennessee Employers. Ogletree also authors our Massachusetts Human Resources Manual, Colorado Human Resources Manual, and Employee Benefits – An Employer's Guide. You can find the original blog post and their Workplace Safety and Health Insights on their website. Tennessee property owners, including employers, are generally authorized to prohibit the possession of weapons by any person at meetings conducted by an employer or on property owned, operated, managed, or under the control of an employer. Tennessee has adopted very specific requirements for how employers and other property owners must notify employees and visitors when they seek to prohibit firearms on their properties. Notices of such a prohibition must be posted in prominent locations, including at all entrances primarily used by persons entering buildings where weapon possession is prohibited. 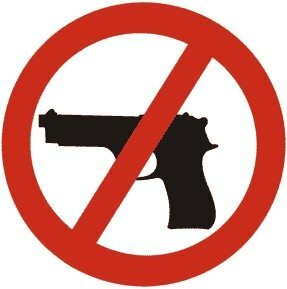 If the possession of weapons is also prohibited on the premises of the property as well as within the confines of a building located on the property, the notice should be posted at all entrances to the premises that are primarily used by persons entering the property. When an employer’s property has been properly “posted,” possession of a firearm is a crime. a picture of a firearm inside a circle with a slash symbol over the firearm, at least 4 inches high and 4 inches wide with the diagonal slash at a 45-degree angle from the lower right to the upper left of the circle. Again, Tennessee law still generally allows employers to prohibit employees and others from having firearms on employer premises. Previously, the only exception to this rule was that an employer could not prohibit a permit holder from keeping a firearm locked out of sight in his or her personal vehicle parked on the employer’s premises. Now employers, at their option, can allow permit holders to conceal and carry handguns anywhere on employer premises. This article was drafted by the attorneys of Ogletree Deakins, a labor and employment law firm representing management, and is reprinted with permission. This information should not be relied upon as legal advice.